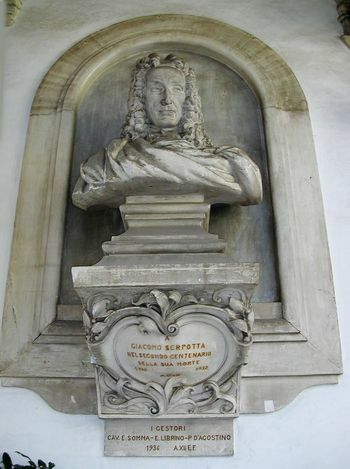 Giacomo Serpotta, in another tonality, for the Oratorio de San Dominico, also in Palermo. Here the sense is weightier in overall tone, if in turn the actual “content” seems lighter – a seeming procession of ladies of high society parading the metaphoric virtues (which one doubts they had themselves). Exiting from the clatter of the fetid streets of la cala in the center of Palermo, and entering a side-door to Chiesa di Santa Cita, one climbs a set of stairs and an open balcony welcomes with several young women chattering away, one of whom asks to see your pass for the Palermo Baroque church tour. She glances, nods, and resumes her conversation. A notice on the wall says no photography. We enter into a flood of light, the sun bouncing off the white stucco walls and the dazzle of a wedding cake decor, so dense as to make the eye and mind whirl. There is no one there. Sedately, to the far end, a dark Carlo Maratta Virgin of the Rosary attempts and fails to distract. You are in the Oratorio del Rosario of the Chiesa Santa Cita, caught in the delirium of Giacomo Serpotta’s rococo world, where a swirl of sculpture and ornament overwhelms the senses. It is, in some ways, all too much – an assault so forceful that it seems to defeat its own purposes. How is one to look at all this when it seems every surface is swarming with a delicate white meringue of whipped egg whites, all expertly formed into the most delicate of portraiture, as well as the customary billow of clouds and cloth, and an avalanche of putti? The immediate response is almost to pass out, to flee from this overload on one’s senses, and perhaps, taste. And yet, beneath this riot of plaster excess, there are myriad quiet corners, exquisitely detailed little stage-sets, telling, as usual in Italy, the same story to which Italian art was shackled for almost two thousand years. Here it is told with a lightness of touch that amazes in its simple delicacy, especially when framed by the tumult of putti and angels which adorn this place of putative prayer. 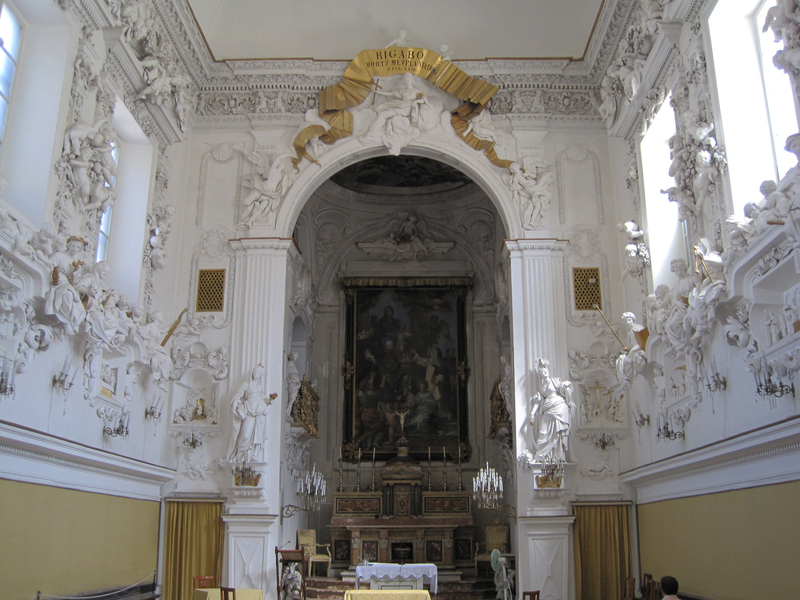 Recently restored, this chapel is the work of Giacomo Serpotta (10 March 1652 – 27 February 1732), who specialized in stucco – a kind of plaster which he made more sophisticated by mixing in marble dust which gives it a more brilliant and hard surface. Stucco must be worked quickly, while still wet. Once set it may be carved, more easily in the mixture which Sepotta used. 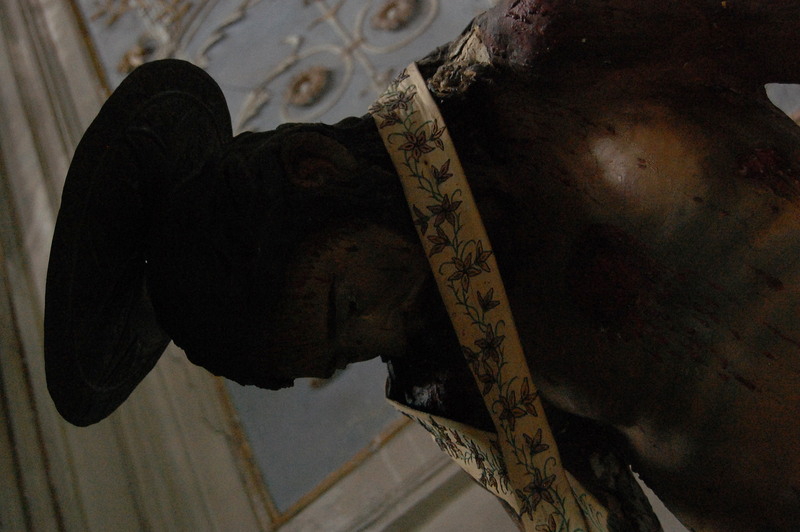 A native of Palermo, the city and other places in Sicily are graced with his work. Evidently he never left Sicily, and so is little known elsewhere. I had never heard of him before despite a fairly reasonable acquaintance with Italian art. In the same church, in a chapel adjacent to the center, reconstructed since major damage caused by bombing in World War II, is another dizzying chapel, this one with mixed marble in-lay. As with the Rosario the initial sense is that of being overwhelmed, but if one stays, and looks with care, it is full of amazing and lovingly done details which seem literally to sing. 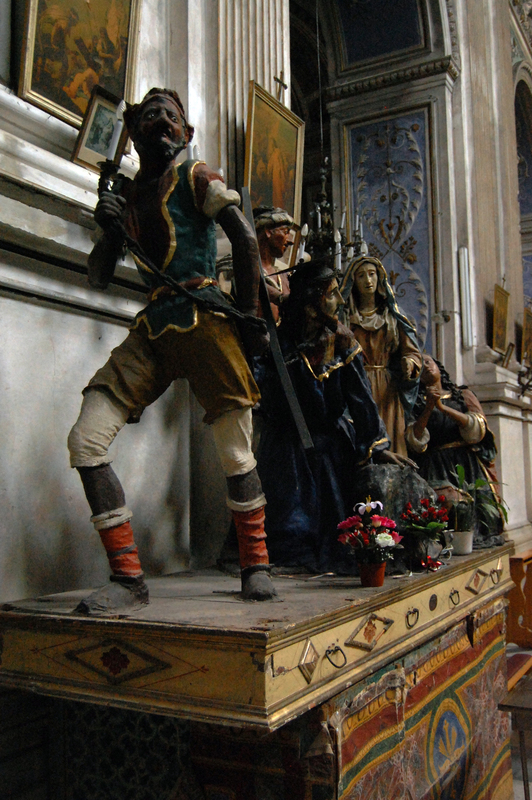 In a small church in Modica, Sicily, I came across this work of what I would think qualifies as folk art. There was no information, and I assume it is an unheralded example of anonymously made religious handicraft, which by the handles on its side seems to suggest it is likely taken out during celebrations, during Easter. Lacking all academic instinct I did not inquire, or even note the name of the church (or town). Instead I marveled at its lively, cinema-like orchestration; the vivid characterizations (clearly out of keeping with present “politically correct” views). And I took many pictures. Nearby, another work, clearly done by similar hands, revealed a truly moving sense of pathos and defeat. While scarcely the equal of “fine” art – Donatello, Bernini, Michelangelo – there is something in the crude and primitive qualities of this tableaux which cuts deeper in an emotional sense. 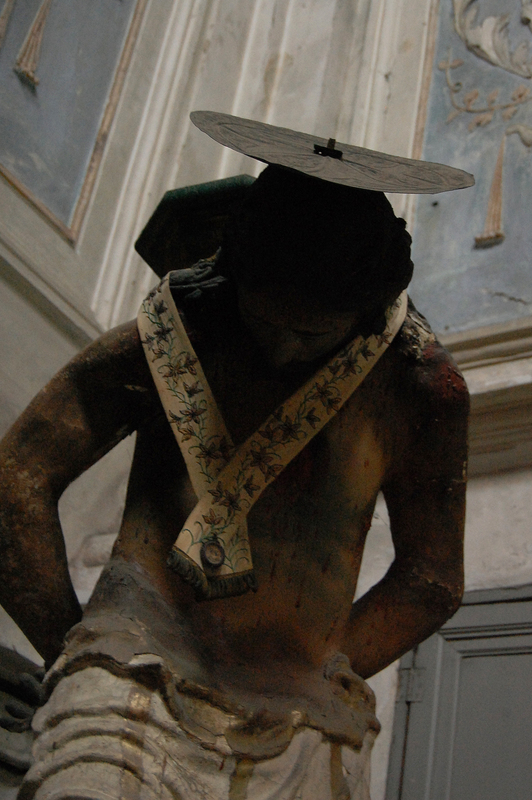 This Christ is far more believable to me than those of Michelangelo’s wet-dreams, such as that in the Chiesa di Santa Maria sopra Minerva in Rome.